Now, anime adaptations of video games aren’t always bad (I think), it’s just not my cup of tea. Condensing a 100+ hour JRPG into about 3.6 hours of runtime is not easy and a lot gets left on the cutting room floor. As a result, I usually avoid video game adaptations, especially if I’ve played the game beforehand. 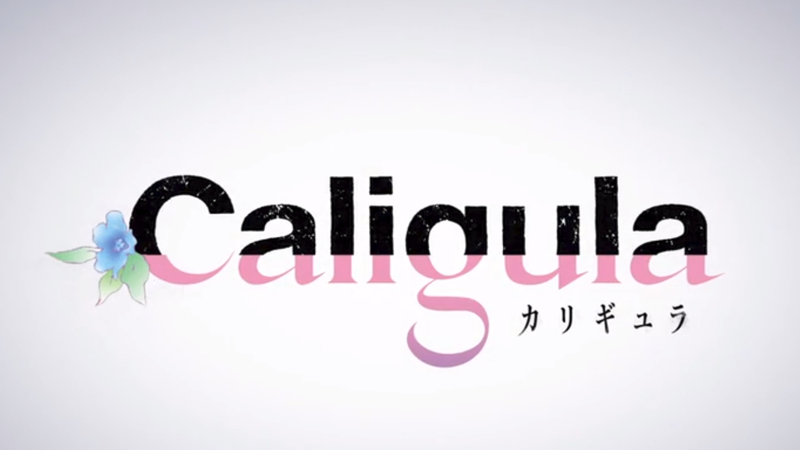 However, I never played Caligula but I was interested in its premise. The music for its promotional video was also my type of jam. With the release of its first episode, I gave it a try. Suffice to say, it was interesting, but I’m not sure if it’s a good or bad interesting. The episode starts with a short monologue from an unknown male wanting to live in a peaceful world without the need of harboring anxiety, though he knows it isn’t possible. It gets cut with a song sung by the virtual idol µ with scenes filled with silhouettes of people, some being colored in. After, it’s back to his room and he seems to be briefly talk to µ, in the abstract “I wish you were real” way…except it seems she’s real?! Girl in green? Likely an important character...or at least has speaking parts. Things cut away to the protagonist, a teenager named Ritsu Shikishima. He’s riding the train with another classmate, Mizuguchi, who asks about the book he’s reading. It’s a social psychology book and he starts talking about the subject he’s currently reading about: a Johari Window. Ritsu’s the smartly dressed guy. Oh Mizuguchi, you probably just gave him a starter to monologue about psychology. In fact, psychology seems to be Ritsu’s forte, as he will randomly discuss a psychological concept while doing mundane, high school things. Talking to friends and walking to a ramen shop? Break out the idea of “bias causes myopia” and explain it using an experiment with Northern Pike. Watching a fight break out in the school yard? Maybe his friend is trying to engage the “gain-loss effect”. That was one of the things that stood out in the episode, Ritsu’s psychology talks. They’re not short asides or tangents but are explained in relative detail, likely for the audience. I do appreciate that when Ritsu is explaining a concept, the show cuts away to different shots or uses the background to illustrate the idea. It’s a nice touch and it keeps things interesting instead of having a static shot with a voice overlay. In addition, while I can understand some people being turned off by his interludes, I felt that it was exactly how teenagers would try to interject what they’re currently interested in during conversations with friends (it also helps that the concepts were interesting). Presumably, the concepts are also linked to some of the central themes of the show, especially when talking about the Northern Pike experiment*, as Ritsu’s friend comments that there’s no such glass walls in the world. In any case, Ritsu and friends end up going to a ramen shop, where we get introduced via reference and cutaway to ‘famous’ gossip Narukonne (Morita Naruko). It’s a pretty short sequence with her before we return to Ritsu and friends eating ramen. However, just as Ritsu takes a bite, it cuts to a girl named Mifue having dinner with her mom, who is clearly in an unhealthy state (she doesn’t eat because she quickly gains weight). Personally, I felt the cut was a bit random and intrusive. Sure, both Shikishima and Mifue are both eating…but that’s kind of it? Mifue’s scene does serve a purpose though, as she sees the idol µ floating in the air at night. Then things start to become unsettling (for the characters, as the viewer it was expected). While listening to µ’s newest single, the music gets distorted and he hears someone calling for help. Things cut away to the morning after and we follow Mifue again who greets her mom at breakfast, except it’s a completely different person. Hm. While the first half of the episode was a very idyllic showcase of Ritsu’s life, he starts becoming more aware of something being off about his surroundings. Asking his friends about the weird call for help he heard during µ’s song gets no reaction from them,and when he starts playing it everyone around him seems to stop and stand to attention in sync. The aforementioned fight occurs, and one of his friends goes to join in the scrap while Ritsu can only talk about the gain-loss effect and laugh nervously. At home, Ritsu reads through one of his psych books (seriously, he likes psychology) before he gets images in his head when he touches the page related to “self-punishment.” I’m going to guess these are flashbacks to his life before getting in contact with µ. Maybe he was the unknown bloke at the start of the episode (though the voices are slightly different). In any case, Ritsu starts reflecting on how he’s starting to notice things being different and contemplating how the illusions of his life are seemingly starting to crack. One of these things is not like the others, one of these things is becoming aware! Things then cut back to high school, where Ritsu sits in an auditorium for his seniors’ graduation. There’s an address by the representative of the graduating class, and things are hunky dory as everyone celebrates the graduation. Graduating class representative giving a speech. It’s now the high school entrance ceremony! And the representative for the incoming class is…the…same…guy…as the graduating class? µ appears and starts singing. The song continues as an overlay while some of the students turn into weird monsters and start attacking the unturned students. Screaming! Panic! Run! We get snippets of dialogue from characters we’ve never seen before (except as colored silhouettes), who understandably run away from the monsters. Meanwhile, Mizuguchi from way back at the start of the episode asks Ritsu what is going on. He grabs her hand and runs with her out the auditorium, chased by a few of the monster classmates. The song is still playing with a cute jpop tune while the lyrics are far more uncomfortable**. Eventually, Ritsu and Mizuguchi run into the guy who was fighting earlier, except now he has a really big gun. He promptly dispatches the monsters while we get ominous shots of the auditorium and some of new characters who simply watch on. Ritsu starts questioning his what the situation is as the opening theme kicks in, before he calls his savior a “murderer”. Cue the opening sequence. Plus a very stylized preview sequence! The sale is almost over? What’ll I do! Curse you limited time sale events! A lot of things happen in the first episode, but nothing really moves forward until the very end. I believe we can safely assume that it’s all set up for later down the road, but it’s not entirely clear how things are going to proceed onward. Personally, I hope the anime manages to balance the action with heavier themes, whether that’s about dealing with depression, individualism, or how technology has drastically changed how we interact with each other. The animation itself is fine by itself, but I appreciate some of the directorial choices, such as how when Ritsu talks psychology, it isn’t a static shot but much more illustrative cutaways or animations. As a first episode, it’s alright, and could potentially be a solid show this season. We’ll have to see where things go in the next episode! Caligula is currently on Crunchyroll, likely being uploaded every Sunday. *The pike experiment: put a pike in an aquarium with smaller fish and the pike will attack the fish. Put a glass wall inbetween the two and the pike will crash into the wall. When the wall is removed, the pike will hesitate to attack because it remembers the wall). **After a bit of internet sleuthing, I found that the song is called “Peter Pan Syndrome,” written by 40mP. If you’ve played some of the Project Diva series, the name is likely familiar.